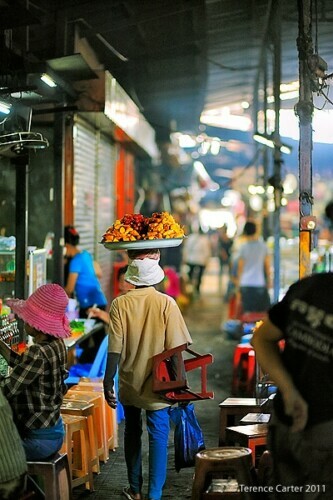 Like all South East Asian cities, the Cambodian capital has a few standout markets that are worth a wander to soak up the atmosphere, snack at the food stalls, and, naturally, shop for souvenirs. 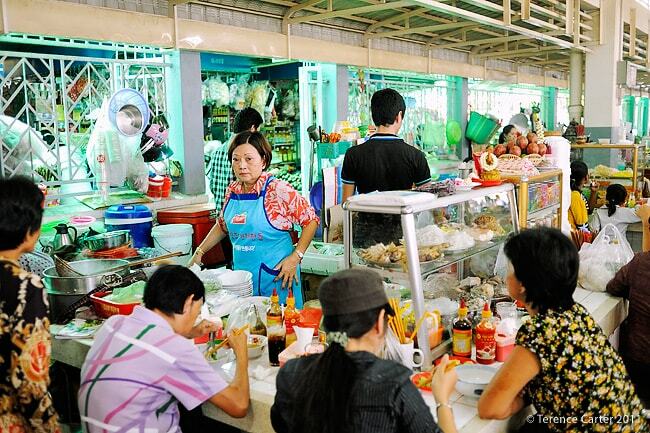 Here’s our mini-guide to the best Phnom Penh markets for visitors to the city. We stumbled upon the buzzy outdoor night market opposite Sisowath Quay on our first ever evening in Phnom Penh. We thought it was odd at the time that the market hadn’t been recommended to us by anyone but quickly realised it was because it had only just opened. We had assumed it was because it didn’t have a whole lot on offer for travellers to buy in the way of crafts or souvenirs; it took us less than half an hour to do a lap and that included browsing each stall. But it was the fact that its stalls of clothes, accessories and knick knacks were aimed at young locals that made it all the more fascinating. Plus it had a lovely, laidback feel to it the first night we visited. Now it’s much more popular and gets a lot more busier. The irony is that the government had actually established the market for tourists, yet it has proven over time to be much more appealing to locals. While the racks of clothes on sale are squarely aimed at locals (miniscule sizes), the souvenirs sold (Cambodian silks, lanterns, colourful rice baskets, etc) are selective and of fairly good quality. There is always a festive spirit to the place when we visit, with good-looking young local bands performing on the stage and smartly-dressed locals enjoying a night out. It’s a fun place to stop on your way out to dinner. 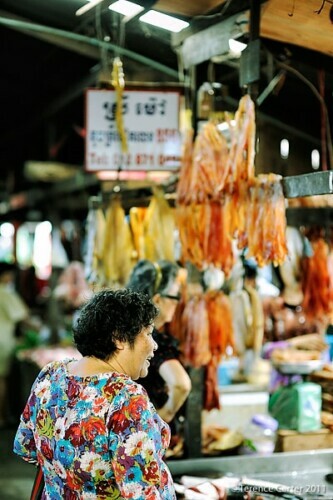 Markets in Phnom Penh, Cambodia. Reopened just before we arrived in town, after having been closed for a long renovation, the splendid, yellow, Art Deco Central Market, built in 1937, is a must for architectural buffs as much as foodies and souvenir-hunters. 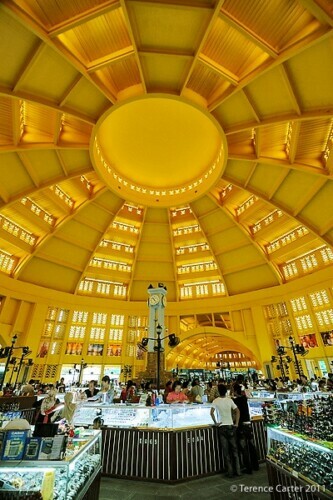 Under the colossal central dome are jewellery ‘shops’ – little more than glass counters holding silver jewellery, watches and gems – while the four wings leading off the central hall sell a wide variety of clothes, shoes, bags, luggage, household goods, electronics, and books. There’s also an abundance of souvenirs, including Cambodian handicrafts, wooden carvings, silks, and kramas, the traditional checked cotton Khmer scarves. There are plenty of food stalls as well, most of which can be found on the western side facing Monivong Boulevard. 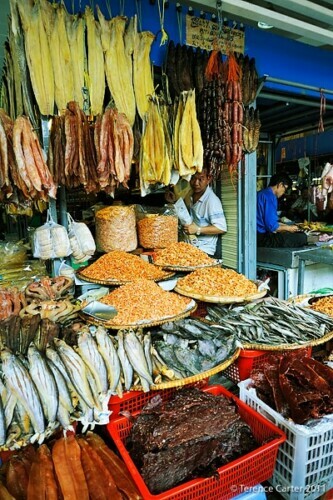 You’ll find everything from fresh fruit and veg, fish and seafood, sausages and meats, as well dried foodstuffs. 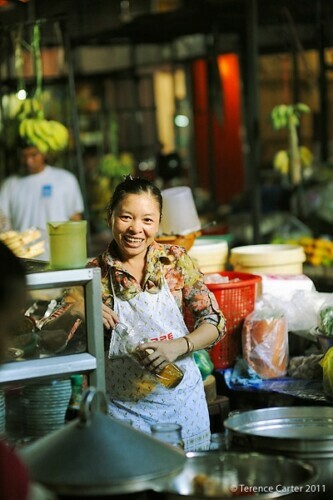 There are also sit-down stalls dishing up hot soups and curries, spring rolls and salads. 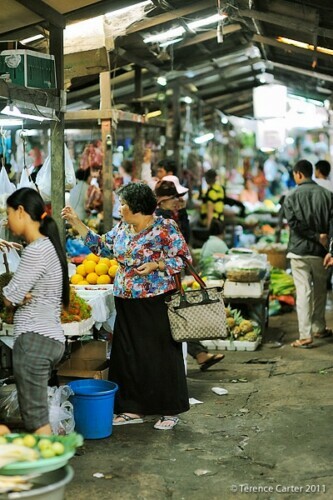 This dimly-lit market became popular with foreigners during the 1980s when it’s said that many of the foreigners in Phnom Penh were Russian and the market teemed with the enthusiastic shoppers, hence the name. 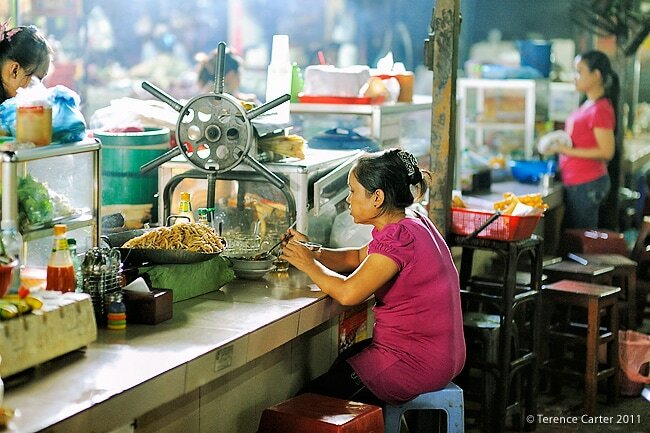 While it doesn’t have the architectural value of Central Market, photographers will enjoy the atmospheric interior, with its narrow aisles and interesting contrasts between light and shadow. The market has plenty of stalls selling souvenirs and handicrafts – ‘silk’, textiles, kramas, baskets, carvings, and t-shirts – as well as clothes, shoes and bags. There are also counterfeit CDs, DVDs, and software, along with a few shops selling retro posters and vintage clothes. 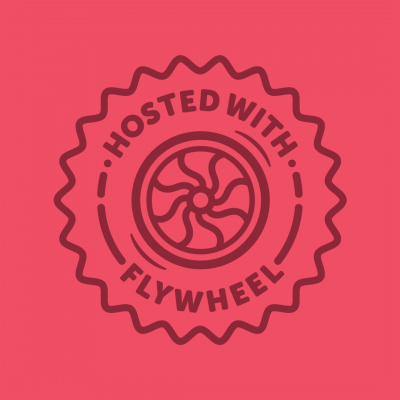 You’ll also find lots of affordable luggage, if you’re on your way home. 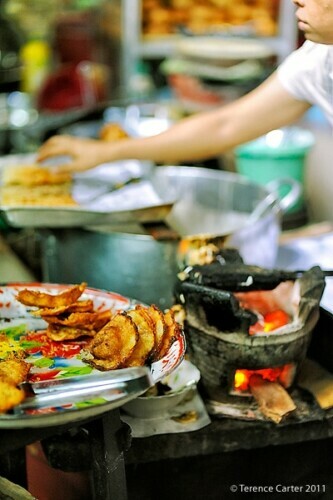 There is a small fresh food market and stalls selling dirt-cheap home-style dishes, included soups, curries, noodles, and rice dishes. 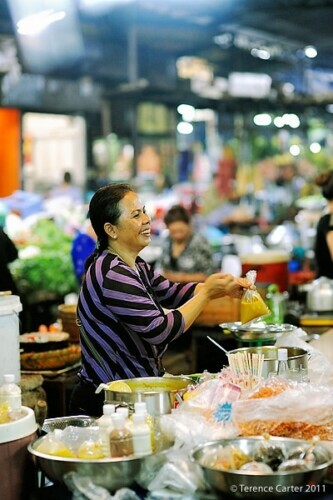 * Phsar Kandal – a gritty local market not far from the riverside that’s crammed with tiny shops and stalls that has some fantastic food stalls. 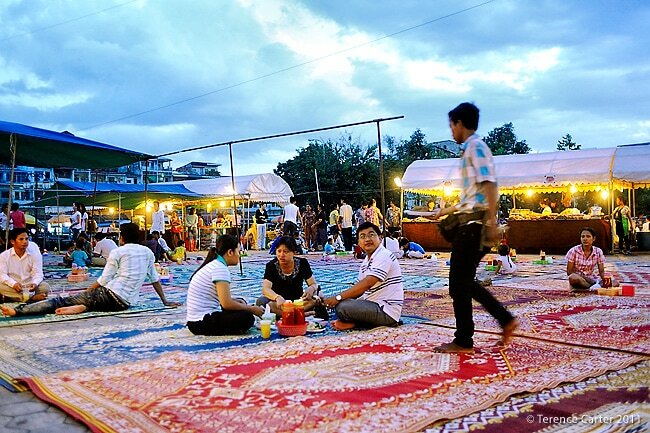 We’ll be writing more about Kandal market soon. 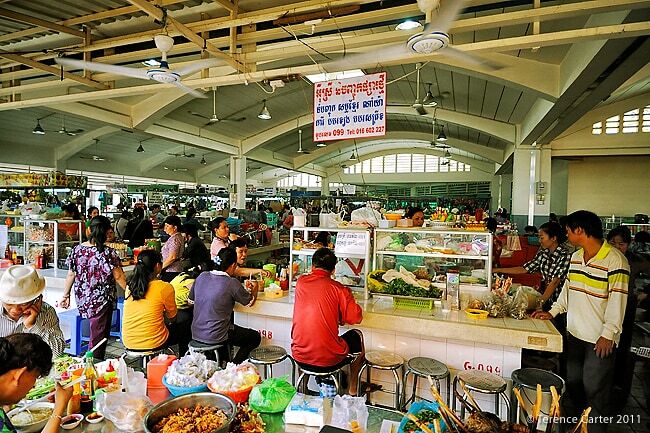 * Phsar Orussey – this massive market teems with locals and expats and it’s where we go to buy household goods we can’t find in Siem Reap. 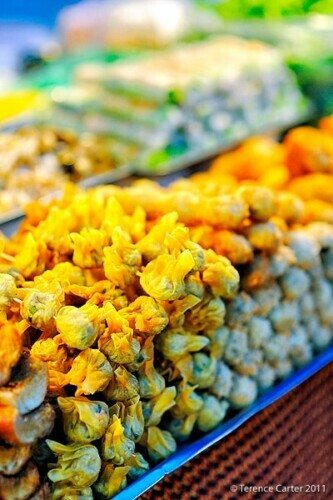 It’s not of a lot of interest to tourists unless you’re a foodie or fan of markets. Expect more on this market too soon. We weren’t in PP long enough for the Russian Market, but I did walk away with quite the loot from the Night Market in Siem Reap. I only went to Central Market and Russian Market and both were OK to me. I just didn’t like Phnom Penh that much and maybe my impression of the markets were not that great either. I really like your photos! Thanks for the kind words re Terence’s photos. 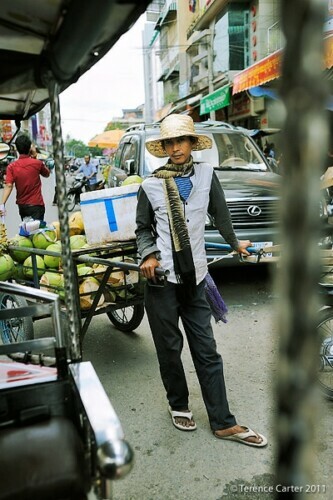 Phnom Penh is a very gritty city and people either love it or hate it. We’d visited a few times and really liked it, but we tried living there and weren’t as impressed. 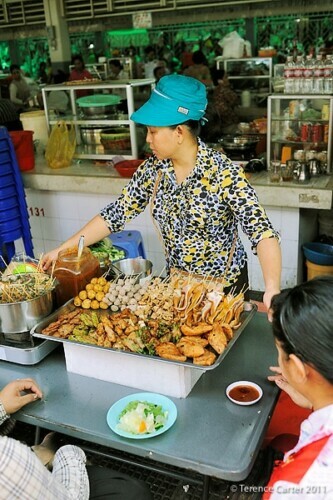 We much prefer to live in Siem Reap and then visit Phnom Penh every now and again to eat at our favourite noodle and dumpling joint, catch up on the latest restaurants, do some bar hopping, and go shopping. I love the markets, but I know they’re off-putting (especially their smells!) to a lot of people. They’re definitely not as clean as they are in Vietnam. I lived in Phnom Penh for a year near the Phsar Orussey. It is a great market. I was always treated like a local. I remember the lady selling pineapple, I would tell her how many I wanted and I would go looking around. When I returned they would be there all cleaned, cored and in a bag. 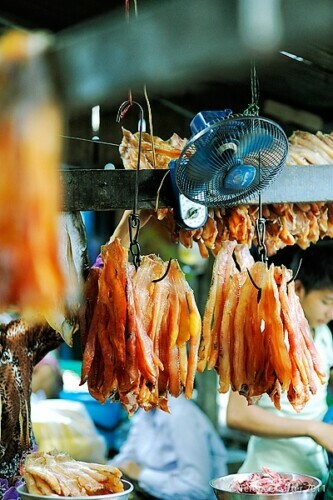 I love how they do things like that in markets here in Cambodia/Southeast Asia. Isn’t it wonderful? We’re visiting Australia at the moment and I’m missing those gestures.